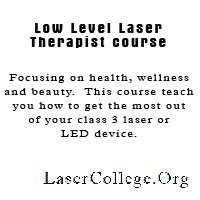 Become a qualified Low Level Laser Therapist. The Low Level Laser Therapist course was developed to teaches you everything you need to qualify as a low level laser therapist – you can study it from home, at your own pace. Do you want to qualify as a laser therapist, but simply cannot stop with working to go for training hundreds of kilometers away? Or maybe you are at the beginning of your career and would like to ensure that you have the best suitable training that set you apart from all the other. The original Laser Therapy course, by Raymond Schoeman of ALC Lasers has become the foundation of this advanced course. 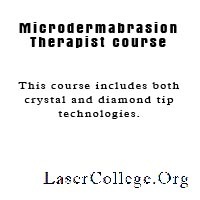 We have build it out into an international recognized course at the Laser College and are proud of the fact that it is still the most complete course available for low level laser therapists. The South African Department of Health has been satisfied that it is in line with all their requirements and the Cape Peninsula University of Technology calls it “well-organised and well-presented”. The course has also been presented at a range of other beauty schools and institutions. Being in the laser industry since the 90’s, Raymond and the other course co-coordinators have encounter the same problem over and over in various countries. The lack of unbiased lasers training courses. This is partly because the industry is still young and also partly because of the prices of equipment. There are very few laser training institutes that can afford a range of different equipment to offer their students exposure to different technologies and machines. The Laser College has overcome this problem by choosing course co-coordinators from different backgrounds and making their knowledge available on a platform that expose the student to various technologies and machines. The Low Level Laser Therapist course offers you the opportunity to qualify as laser therapist online at the comfort of your home and at your own time with personal expert trainer support. On completion you will enjoy the benefits of a recognized and accredited qualification. You will learn about low level lasers and LED technologies. You will view videos and use other interactive media to learn over various procedures with all different kinds of machines. You will be spending your time efficient by choosing your study time when it suits you best and at the place you prefer. You will enjoy full trainer support, either via chat, forum, email or telephonically. You do not have to wait for other students to reach your level before you can discuss topics relevant to you. You can start your studies at any time, no fixed starting dates. 24/7 online library and resources: We provide you with the links that will take you directly to your resource material. No time is wasted searching for books or research material. You save money: All learning and assessment material is included in your course fees. You are not required to purchase any additional material. Reduce your carbon footprint: Daily travel amounts to 23% of household greenhouse gas emissions — Cool it — Switch to low greenhouse impact study options like online study and use phone or email for support to address Global Warming. We are sure that you have come across various laser courses in your search for the right training course for you. However, most courses are extremely limited to their subject area and are sometimes very machine specific. While others promise you all the knowledge you will ever need in 2 or 5 days. It is of utmost importance to be realistic about laser training, as is the case with any other training course you may undertake. We will provide you with a complete course, covering a wide range of treatments and procedures. All this at your own tempo and the comfort of your home, but with full personal study assistance. Describe the difference between spontaneous and stimulated emission. Describe the various components of laser, IPL’s and LED’s. Describe the various modes of operation. Describe the light beam characteristics for laser, IPL and LED. Describe the characteristics of light. Describe and apply the treatment parameters. Describe the effects various forms of radiation have on the body. Describe the various wavelengths used for hair removal. Describe the 3 main biological changes caused by temperature in the body. Describe the laser classification standards. Describe the various eye and skin hazards. Describe the various eye and skin protection measures. Describe non-beam hazards and define the NHZ. Describe various safety control measures. Explain and understand the necessity for indemnity forms. Introduction to Low Level Laser Therapy (LLLT). Indicate the various fields Low Level Laser Therapy are used in. Describe the basic treatment procedure. Describe the various recommended treatments. During this topic you will get an in-depth look at the treatment of various humans illnesses with LLLT. This topic will give you an overview of the use of low level laser therapy on animals. At the Laser College your learning is our top priority. From the moment you register, during your training and even after graduation, we strive to provide you with high quality, state-of-the-art training and the highest level of student care possible. Our mission is to help you to become a highly skilled laser therapist. To help that endeavor, we’ve created a number of programs and services, including our student satisfaction guarantee, designed exclusively to get you the training your want, when you want it. We are so confident with the quality of our training courses that we provide you with a money back guarantee. If you are not satisfied for any reason, or the course does not live up to your expectations, you will not lose one cent. We will refund you for the remainder of the course you have not completed, right up to the final day. It does not matter if you have been busy with the course for 2 weeks or 4 months, there is no time limit to this guarantee. If you still have some questions that are unanswered, please feel free to e-mail us at info@lasercollege.org or you can also contact the course leader directly by e-mail at Raymond@lasercollege.org or phone 0032489409804. Or you can also have a look at our Frequently Asked Questions. 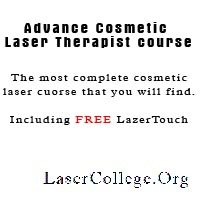 To enroll for the Advanced Cosmetic Laser Therapist course please visit www.lasercollege.org or click here and register as an user on the website. Once you are logged in you can easily enroll for the course by clicking on the course name. This will take you to a secure PayPal page where you can pay the enrollment fee with any of a range of payment options. (It is not required to have a PayPal account to enroll). Once the enrollment procedure is completed you can get started immediately.